I'm continuing on with my 1 hour per day plan for this Iddy Bitty quilt. On Saturday, I soon realized my hour was going to be taken up by mostly rooting through my stash for backing, batting for this quilt, and then giving all the layers a good ironing in preparation for the layering. The only bit of sewing was making 200" of bias binding. 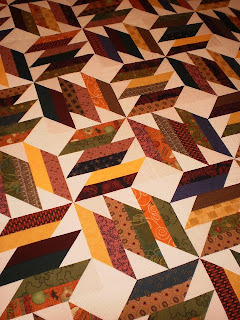 On Sunday, I spend a good part of the hour taping my backing to the floor with masking tape, then doing the same to the batting, then finally layering the quilt top over that. 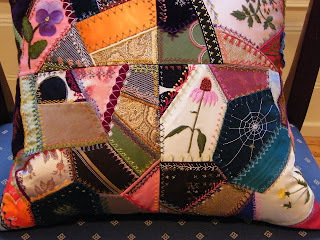 On a cushion, I knelt down to put in all the safety pins. I still have to close the pins, but other than that, I'm ready to machine quilt today. The final hour is scheduled for Tuesday, which will be to apply the binding. Stay tuned. Yesterday, I stitched up these labels on my embroidery machine. I'm so good at making quilt labels for my quilts that are given away for raffle quilts, but not so good at making labels for my own quilts. I cannot think of one of my quilts that has a label. The Nines and Vines Quilt for the Stan Cassidy Foundation is only a week or two away from being finished. 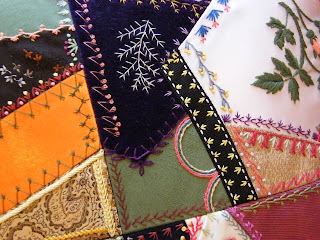 You can follow the hand quilting progress on the FQG blog here. It's so nice. And the LeMoyne Star which is being quilted at St. Anthony's church will be finished before the spring. We are well into the stars, but I will do a photo update this Wednesday when I go. This week is going to be special because Cecil G. is going to join us on Wednesday for some hand quilting. It's nice to have a special guest. I might try to arrange more special guests to keep things moving along while I'm away. So, where did I find such a cute pattern you ask....I follow Natalia's Piece n quilt blog faithfully. She's such a wonderful designer of quilt patterns. 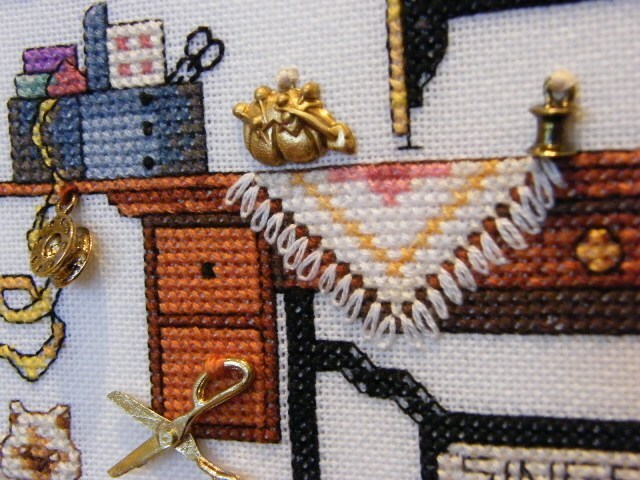 She designed this Itty Bitty Babies pattern in both a baby boy or baby girl quilt for the Moda Bake Shop. 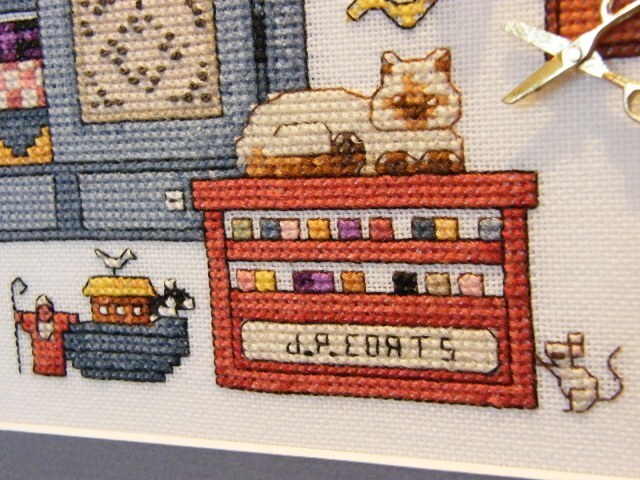 For the free pattern, click here. Now I want to make the baby girl version... too cute, and thanks Natalia for sharing your talents. I have all my charming blocks put together. With another hour's worth of work tomorrow afternoon, I'm positive I'll be able to show you the entire top. And I'll share the location of the free pattern with you as well. There is another colorway that is equally as nice. 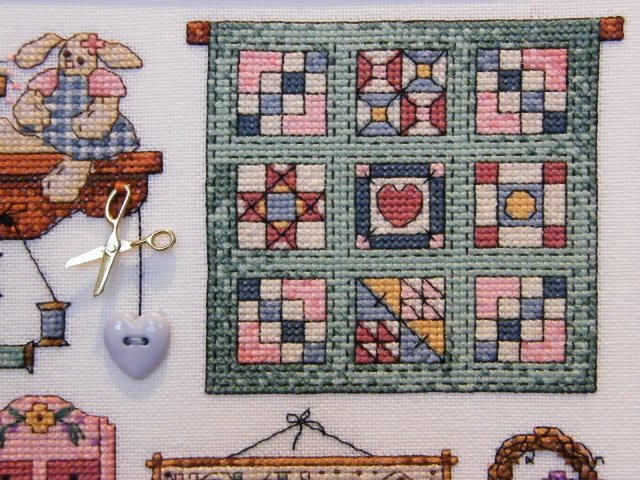 Or maybe you know which pattern it is since it has this unique grid on it. After tomorrow's work, I'm sure that with 1 hours worth of machine quilting, and one hour of binding (by machine of course) , it'll be done. 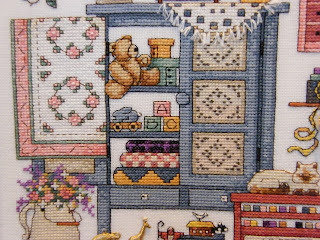 I love love love this little pattern and I hope you do too, when I reveal later tomorrow. Like the advertisement says...Good to the last drop! Ice Cream that is..
And what could be better than a good book after you've had two helpings of ice cream! Aurora recommends this book... Flik's Perfect Gift. A story about an ant named Flik's birthday. One of Flik's friends says "What's bugging you Flik?". The puns are so cute. Do you recognize this box? Yep, a Singer 221...aka - a featherweight. I had no idea I really wanted one until I got this one home. It doesn't have many accessories, but it did come with a couple of bobbins. I have an old jar of feet that came from my mother's sewing room and I'm positive that some of those feet will fit this machine... I can't wait to try them. Anyway, according to the serial number, this Singer 221 was manufactured in 1951. I guess the fad for quilters is to have one that was manufactured in the year you were born. I'm a few years off, but I think I'll love having this little gem just the same. Is anyone keeping count of how many sewing machines I have?... Care to guess? Do you remember Betty Boop? She was my one of my favorite cartoons when I was a kid in the 50's. Last year I got a T-shirt nightie that had Betty Boop on it, and Aurora loves to look at my Betty Boop. They are quite quick to make up, IF you have a small stash of all the supplies...minkey fabric, ribbons, and silky polyester fabric for the backing. These are all soft and soothing senses for little fingers. Will definitely quietly sooth and comfort a little baby. Did you notice that I didn't use the plural of the word Mitt in the title. Its because I've sort of made it through one mitt. Isn't it nice! I love the basketweave detail on the cuff. It's so different than just regular ribbing. But I have to tell you that I do intend to rip it out and start over for the third time. I knew I had a mistake in it as soon as I finished the cuff and was starting on the main part of the mitt. Look below for the obvious mistake I made.. I'll be unravelling and restarting to knit this evening. I'm hoping to have a pair - yes two - knit and finished by Monday morning. I'm so pleased to present "Autumn Swirl". The St. Dunstan's Quilters will be loading this quilt in February and hand quilting through the rest of the winter, spring and probably into the summer. It'll be their raffle quilt that they unveil in the fall. 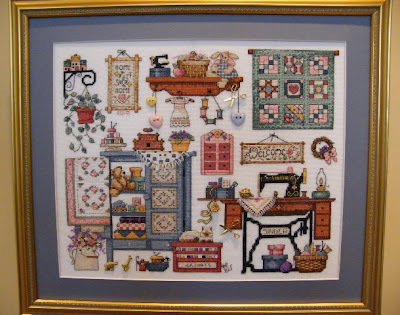 Of course, those of you who follow Bonnie Hunter's Quiltville, will recognize this as her Weed Whacker Quilt, with some modifications to the border. I'm going to be visiting my friend Rose this week, and she'll do some marking before it goes on the frame. I'm so glad that she's feeling better and has even gone out for visits with the St. Dunstan's quilters a few times recently. She's looking forward to marking and unveiling to the other quilters. And I'm glad it's done too. It was my last major project before we head south for some snowbird time away. Another great day today at the Sussex Quilt Guild doing the Spicy Spiral Tablerunner. I loved ll the colors. I've made a little progress this week. Mostly today, as a matter of fact. The end is near on this and I'm getting distracted by other projects. The inner green border has been applied, and I have 2 of the 4 vine borders done. I hope to have the other two done tomorrow. 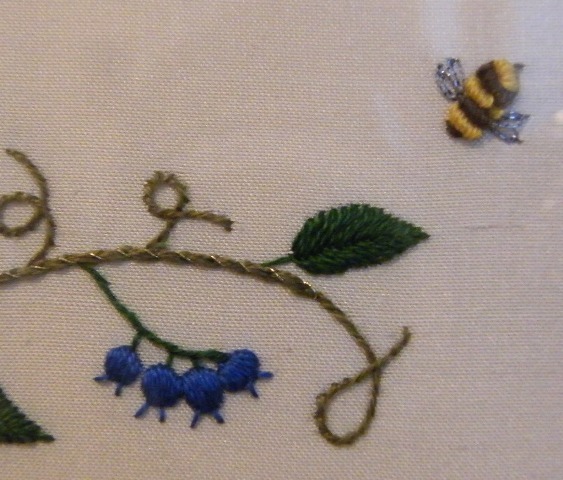 The final step will be to sew the borders to the quilt and connect up the vines. Autumn Swirl. Do you like the name? I'll be making the label this week. Note: These directions are for the Kobo with the button that flips the pages... not the Kobo Touch. A picture tutorial to make an envelope case for the Kobo Touch can be found here. You might have expected this. Today, hubby drove me to the store and took his Kobo to read in the car while I was in the store. We realized that we needed a carrying case. So, when we got home, I whipped this little case. See, I had made a case last year for a friend (hi Jill) and used the Moda Bakeshop Bookkeeper pattern. 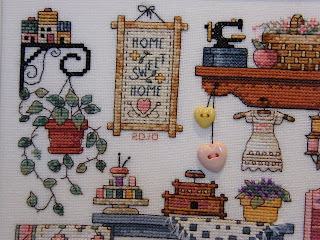 I really liked using the fun red colors and the chance to use the nice fancy stitches on my sewing machine. But since this is my hubby's kobo, I used more masculine colors. I then measured and adjusted the pattern sizes for the Kobo. Too simple. Took me less than half an hour using scraps that were on my table.... (could this look similar to the church quilt I'm working on....ha ha). Just in case you have a Kobo and want to make one, here are some details. The size of fabric sandwich you need to start with is 14.5" x 9.5"
After quilting, trim down to 13.75" x 8.75"
Fold this short side with the binding up about 4.25" to form the pocket for your Kobo. Stitch the pocket sides about 1/8" to keep from shifting while binding. Then starting at the bottom corner, add binding to three sides. Closed size is 8.75" x 5.25"
Dear Kobo - What's for supper! I'm not much of a reader. I've always said I'd like read more, but it never happens. I probably read 3 or 4 books a year. I know real readers who read a minimum of 15 to 20 books a year. My hubby is a reader though, and we thought this new Kobo eReader would be a good way for him to stock up on his reading material before we head south for the winter. I think I'll like to use this Kobo in the kitchen. 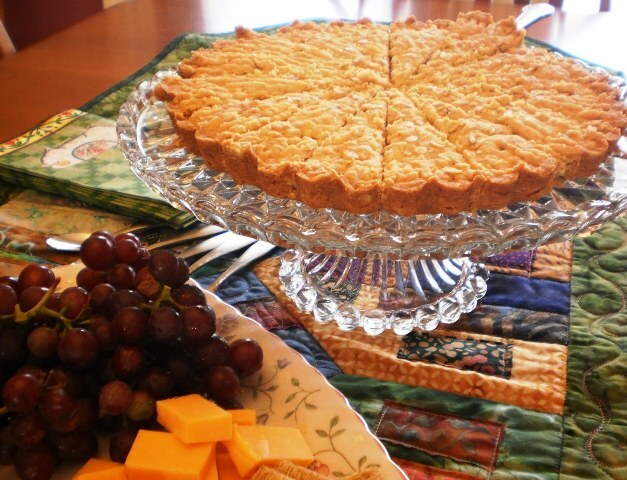 Have you ever found a great recipe on the Internet, only to have to write it down on a paper, or print the recipe off to take to the kitchen. For supper tonite, we're going to try TGI Friday's Sizzling Shrimp. And what's for supper tomorrow you ask... Tony Roma's Baked Potato Soup! I'm so pleased. It's been a busy week, but I worked in half hour chunks several times this week. Not only did I finish the 56 blocks, but I have them all sewn together in an 7 x 8 format. It's ironed and ready to have the borders applied. I'm doing two borders. The first border won't take long to apply. 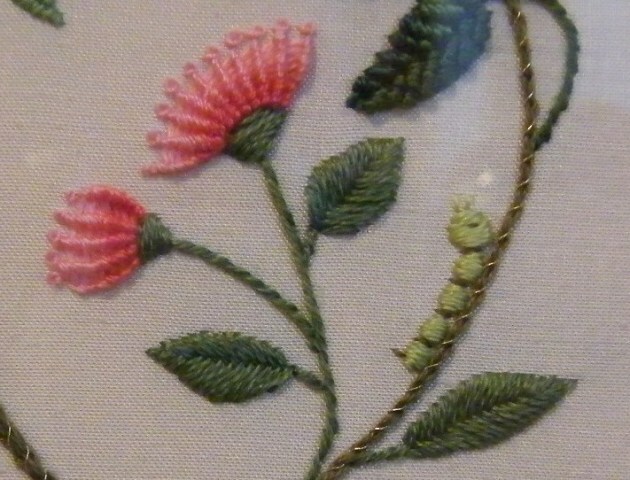 It's a two inch medium green border. The outer border will be a nine inch vines border set on an off white background. The curvy border will sport leaves in various fall colors. 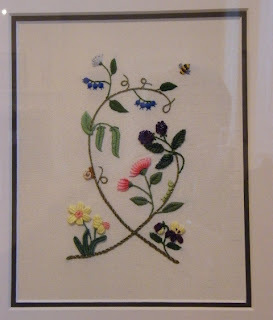 So my goal for next weekend, is to have the bias vines made, and appliqued to the borders. AND have all the leaves made, sewn to the interfacing, trimmed and turned inside out ready to be machine appliqued to the border. I hope to have at least half of the leaves appliqued to the borders. I'm confident that I'll have this quilt ready a little early for the St. Dunstan's quilters. I've picked the date that I will make the label. Jan 20th. By then, I hope to have the name picked. Swirly, twirly, autumn, leaves... are all words that have been swirling and twirling around in my head..
From reading the who's who in the guest book at the show this morning, many have been to see the show already. I can't possibly show you all the pictures. But I will show you my top favorite three pieces in no particular order. This crazy quilted pillow was exquisite. 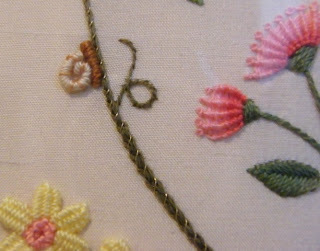 I didn't get the maker's name, but I was intrigued by how she stitched her seams so different than I do. I love how most of her seams were well inside the seam and the stitching didn't straddle the seam like mine do. It took me by surprise. In the detail picture, I really like the simple feathery spray. 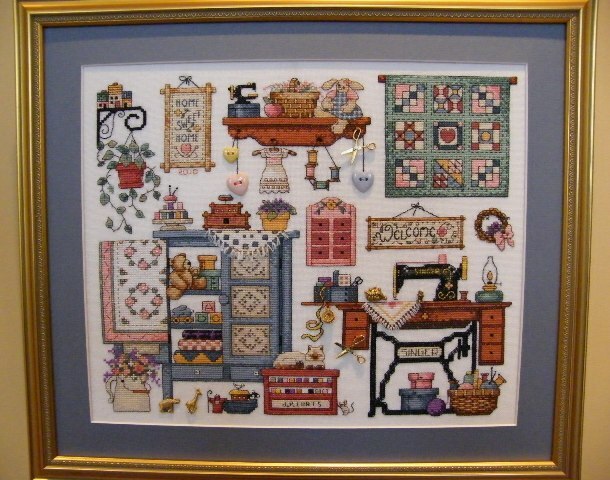 This framed cross stitch is called Sew Cozy by Patricia Drummond. I loved all the detail. 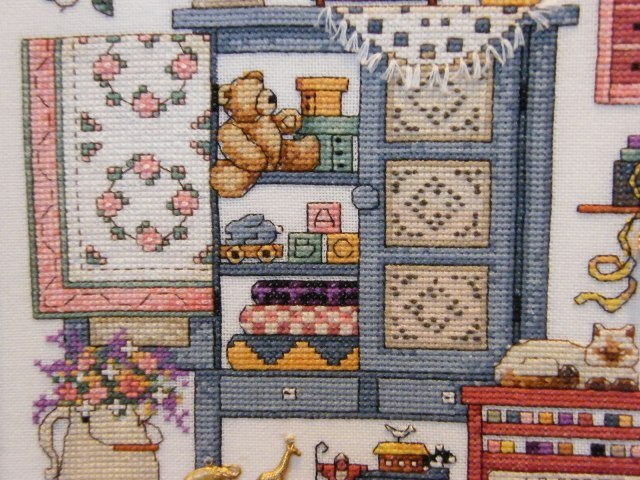 The mouse, the scissors, the cupboard filled with quilted goodies, the plant and even a Noah's Arc. Have a good look at the 5 detail pictures, and you'll have to scroll back and forth to see if you can spot it in the full frame picture. Well there. My favorite three pieces. Are you inspired yet? If you haven't been to Old Government House in Fredericton yet, you can see the show until January 28th. 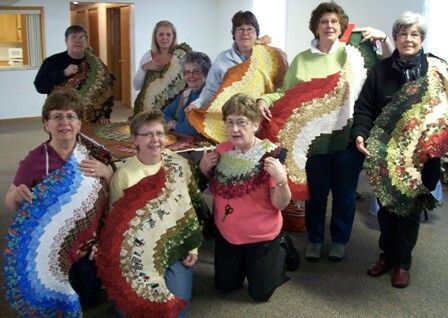 Before Christmas I taught a Spicy Spiral Table Runner class to these friendly quilters from the Keswick guild. Should I start a rumor and call them the Keswick Spice Girls! 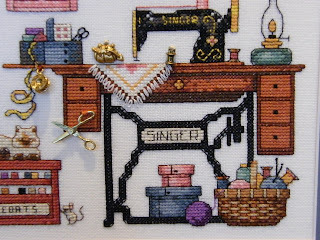 I'm preparing to teach another class in Sussex in a couple of weeks. I wonder if we'll continue to see Christmas themed color combinations, or I wonder if anyone is thinking spring yet. What is a Slip Slip Knit? Did you watch the junior hockey game last night on TV. I did. - Go Canada..... While I was watching it, I decided to rip out my knitting that I started on the weekend. I realized I was reading the pattern wrong. I started over. I knit for two periods of the hockey game.. Got stuck on Row 8 again. The pattern is so weird, lots of turns, lots of picking up stitches both perl wise and knit wise. It's two small gloves, I should be able to get through them... I love a challenge, I hate a challenge.. When I got to row 8, I could see that I was on the right path. The basketweave pattern is starting to form. Can you see it? My next row calls for a SSK which stands for Slip Slip Knit... I didn't have a clue what that was. The pattern didn't explain. I set my knitting down and decided to take a break and enjoy the last period of the hockey. Looked up SSK on the Internet today... I found a good explanation of SSK on about.com.. What a great resource. So I'll continue knitting this evening. I do appreciate the suggestions I got on my previous post for a nice name for the Fall inspired raffle quilt that I'm making for the St. Dunstan's Church quilters. I haven't chosen a name yet but soon. I'm leaning towards the "Twirly" names that Linda left in the comments. So I have the kit cut and I've got a good start on sewing. I'm now adding the 3.5" squares to each end of the strip pair sets. Here you can see the small stack that I have done so far. There are three of these strips sets in each block so that means I have to have 168 of these done. It might be aggressive, but I hope to have all 56 blocks done by next Saturday. This doesn't seem like it's going to be as much work as the Nines and Vines that I did in November, but I don't want to take any chances and miss my "End of January" deadline that promised to the quilters. Stay tuned for next Saturday's update. I love to knit. Even though I haven't knit in about a year, I thought of myself as a very experienced knitter. Until NOW!! I bought some Kroy last week, and decided I'd knit up a pair of fingerless mittens (aka gauntlets) to use specifically when I walk at the Willie O'rena. I will use them to work my Ipod. I got the pattern from my sister's MIL, but it's a toughie pattern. I thought I could knit them while Baby Aurora was here over New Years, but I couldn't get past row 8. So, I'll pick them up again this evening and see if I can make heads or tails of the pattern. Happy New Year. What a lovely day for the first day of 2011. The temperatore was +7 with bright sunny blue skies made this a really nice memorable day. Aurora was here over the New Years and we made a little project. She's really into Strawberry Shortcake, so we stitched Strawberry's kitty onto a taggie blankie... She was amazed to watch it stitch out!! Aurora picked out the ribbons for the taggie and I stitched it up. It's called "Custard" cause that is the name of the kitty cat.